Open studio in Tilburg, 1995. 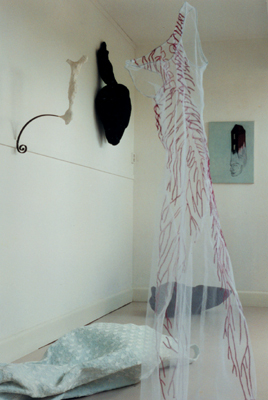 In front: my 'Zenuwjurk' (Nervous dress) made of tule with the nervous system of the human body stitched on. It has travelled a lot of shows since then. On the wall: a small christ without arms on an iron stand (sold) and a black belly sculpture made of fabric on a frame of chicken wire and paper-maché. On the floor: two sculptures made in the same way. The light blue one was later covered in black fabric. The painting in the back is called 'Thuis is een staat van zijn' (Home is a state of being) and is also sold.